A new video and interactive video game funded by beef checkoff dollars is up and running on the internet. 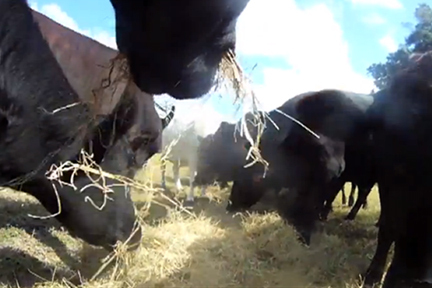 South Dakota beef producers Troy and Stacy Hadrick participated in the production of the video by putting cameras on some of their cows to get a “cows-eye-view” of life on the farm. They spoke with Ron Hays recently about the project and what it means for consumers and producers. “Anytime we can use our checkoff dollars to help tell that story and make more of a connection with consumers, I feel that’s critical,” Stacy said. “What we think the video does is, like Troy said, they see it from the livestock’s point of view-what they’re eating, what they’re consuming, how they’re living. That is just one closer step that somebody that hasn’t had that opportunity to go visit a farm or ranch or feedlot get to see it firsthand,” she said. Troy said they were both pleasantly surprised the first time they saw the raw video from the cow cam, and saw the possibilities for educating consumers. “There are people who have a lot of preconceived notions. And maybe they don’t think we treat our cattle right or maybe think we’re forcing them to eat something. We’re not. These videos are a way for us to clear up a lot of those misconceptions and give people a chance to see the real story,” Troy said. The Cow Chow video game goes hand and hand with the video, Stacy said. The Hadricks said they plan to help introduce Cow Chow to their own community and think it would make a great lesson for their son’s third-grade class. You can see the Cow Chow video and play the Cow Chow game by clicking here. Press the Listen Bar below to hear Ron Hays talking with Troy and Stacy about Cow Chow.